Editing Modernism in Canada joins DHWI! The Editing Modernism in Canada (EMiC) project and the Digital Humanities Winter Institute (DHWI) are delighted to announce the 8th course for the upcoming 2013 institute. Digital Editions, led by EMiC director Dean Irvine, is designed for individuals and groups who are interested in creating scholarly digital editions. Topics covered will include an overview of planning and project management, workflow and labour issues, and tools available for edition production. Participants will be working with the Modernist Commons, a collaborative digital editing environment and repository designed by EMiC in collaboration with Islandora and its software-services company DiscoveryGarden.This course was made possible through the generous sponsorship of EMiC. We invite you to visit DHWI and EMiC to learn more about this training opportunity and this exciting international project. EMiC participants (faculty, postdocs, graduate and undergraduate fellows) and other students affiliated with EMiC co-applicants and collaborators may apply to attend DHWI online at http://editingmodernism.ca/training/summer-institutes/demic/. Read the new DEMiC, DEMiC Travel, and DEMiC Accommodations pages and Application Form carefully. There are new deadlines and new mechanisms of oversight for booking travel and accommodations for both DHSI at Victoria and DHWI at Maryland. Looks like we’re going to have to update that summery URL. Welcome to winter training. Now there’s no off season for DH enthusiasts. A word of warning about the PressBook itself — for time’s sake all of our definitions were lifted straight out of Wikipedia (a practice we definitely would discourage in the classroom). But such is life. Enjoy! This assignment would be built for a 3rd year focused seminar on Canadian poetry. It would be appropriate in both a genre or period-based course where the works being studied are short (ie poetry or the short story). This project would serve as the backbone of the course, and includes multiple assignments each with their own individual learning goals to build toward the ultimate goal of a collaboratively edited literary anthology for the class. The ambition of this assignment overall is to understand how works are selected for a critical anthology and to understand the editorial principles that informs the textbooks the students have been assigned. This is a learner-centered assignment that allows the student to become both an expert in their assigned field (an author) as well as a colleague among peers who must both justify their editorial principles and collaborate with others to create the final class literary anthology. Students will be working both individually and collaboratively. Students will be broken into groups of 3-4 and assigned an author. Each student will be responsible for the selection of six poems that they have selected according to a particular theme or time period. They will make informed choices about the poems they select, and will use an annotated bibliography to review currently anthologized and under anthologized poems by canonical Canadian writers. After consulting a primary resource (an original edition of the poetry), 3 anthologies and critical biographical essays on the authors and their work, the students will create and justify their own digital edition using PressBook software. Then, they will form general editor committees and work together to select only 3 poems to include in the class-wide anthology. Working collaboratively, they will select their poems and write a critical introduction about these choices for inclusion in the anthology. The anthology will end up including approximately 12 poets with 9 poems from each writer. This anthology will be the basis for all questions on the final exam. The student-generated anthology will double as a study guide for the students. Classroom instruction on and discussion of proper citation in the discipline of English. Which sources are peer-reviewed? What is the purpose of peer review? Classroom instruction on the form. Go over examples of others in the field. What type of information do you want to see? What is useful? What is pleasurable? How do you find a balance between the two? Do you need a thesis statement in a critical intro? Classroom discussion of the role of footnotes and explications. Go over examples of over- and under-use. Collaboratively (as a class) come up with a set of guidelines for the footnotes and explications for the classroom. The Edition Itself (Approx 10 pages including previous work). Using PressBooks, bring everything together to create your own PressBook critical edition. 3) Poem, “After the Rain,” PK Page with hyperlinks for footnotes. 5. Editorial principles and selections (500 words): This is your opportunity to reflect upon the decisions you made and your individual selections. It is an opportunity for you to show me how and why you made the decisions you made. assigned reading on editorial theory and practice that will then be discussed in class. What types of editing are there? Collaboratively (as a class) come up with a set of guidelines for editorial principles and selections. Peer review of editorial principles carried by the other two in the group. Pick 3 poems as a group based on a shared set of criteria that is collaboratively determined and write a short critical introduction to those three poems and a brief justification of editorial principles. each group will use PressBooks to create their final anthology. Each anthology will be made available to the entire class. A final class will be dedicated to discuss the process of creating an anthology. The editors of Book 2.0 invite articles on the rapidly growing application of digital tools to research and publishing strategies in the humanities and social sciences for a special issue scheduled for 2013. Contributions may relate to curating online collections and archives, the design and implementation of new applications that support or enrich research, and emerging forms of cross-­disciplinary scholarship that are supported by technology. In particular, we welcome submissions on innovative publishing and dissemination models that increase access to digitised and born-­digital materials. Abstracts of no more than 200 words should be submitted to Dr Mark Turin <mark.turin@yale.edu> and Dr Mick Gowar by 4 August 2012. Book 2.0 is a new, interdisciplinary peer-­reviewed journal focusing on developments in book creation and design—including the latest in technology and software affecting illustration and production. Book 2.0 also explores innovations in distribution, marketing and sales, and book consumption, and in the research, analysis and conservation of book-­related professional practices. Through research articles and reviews, Book 2.0 provides a forum for promoting the progressive practice in the teaching of writing, illustration, book design and publishing across all sectors. Things you don’t even know about yet that will make your life better. PressBooks, which lets you produce beautifully formatted e-books in multiple formats: thank you @isleofvan. Free digitized historical maps from the David Rumsey collection. Visible Prices, a tool by @paigecmorgan which uses the SIMILE scripts to help render historical prices in literary texts comprehensible to modern day readers. OxGarage, a tool for converting just about anything to (lightly marked up) TEI. The beautiful Van Gogh Letters project, whose elegant interface has helped me to think through some of the design quandaries I’d been puzzling over for my own EMiC project: thank you Beth Popham. Many other resources flowed past me on presentation screens and on Twitter, too many to list here. Things that make you think differently about how you do your own work. Using text mining in the attempt to map conceptual space alongside geographical space in Olaudah Equiano’s Narrative (a project by one of my GIS classmates, Elizabeth Maddock Dillon at Northeastern). Using tags to get students to think about the thematic content and structure of their writing (@chris_friend). Things that will make you more literate, not just as a digital humanist but as a member of a mediated society. One unconference session taught me the basic principles behind machine translation (= statistics, not linguistics). Another drew back the curtain on the curious inefficiencies in transforming printed books into e-books, and challenged those of us in the room not just to rethink the structure behind the model, but to imagine ways to change it. That moment when the technology you’ve been wrestling with the whole week actually works, and you manage to do the thing that you came to DHSI specifically to do. Euphoria! Vicarious pride when @jmhuculak gives a demo of the the EMiC modernist commons and virtual flutters of delight ripple out on the tweetstream. This is completely unjustified on my part as the construction of the commons is nothing to do with me, and everything to do with the brilliant folks at Islandora, but when Matt gave the demo, being a part of EMiC made me happy. What a fabulous bunch of people, and what an awesome resource this will be. Collegiality. The ability to explore research questions in new ways with technology might have been what initially brought me to DH, but what keeps me here is the friendliness of the community. In addition to an emphasis on mentoring, there’s also a close critical attention to questions of academic labour, and the material consequences of institutional practices, especially on early-career scholars (on edit: see Alana’s post below). Sharing the love. Three of us got talking on the shuttle from the airport; one person had not heard of Zotero, and her eyes got rounder and rounder as we explained how it pulled bibliographic data directly from the web into a browser plugin where it could then be sorted into libraries, published to the web or dropped into a Word document where it would appear in an already-formatted output style of her choosing. @benwbrum, who I don’t think was even at DHSI, was happy to hear about the Google doc from the regular expressions session for his regex-for-humanists workshop (and actually … where can I sign up for that?). Meanwhile Neatline will be exactly the thing that a non-DH colleague of mine at Strathclyde needs for the C18th correspondence project she’s in the middle of grant-writing for, though she doesn’t yet know it. Generosity. This time last year @mbtimney graciously gave up a lunch hour to do a WordPress install on my server. And I’m particularly happy to have been invited to bring the data from my map of Memoirs of Montparnasse to the Paris map app that Paul Hjartarson, @hquamen and others at UoA are developing for the Sheila and Wilfrid Watson letters. It’s a great example of the connections between editorial projects that EMiC has helped to facilitate. The fact that there’s a decent chance that the person teaching your class, chatting to you in the coffee queue or retweeting your observation is at the top of their field. I had the chance to learn humanities GIS from Ian Gregory. The Omeka demo at the unconference was given by @clioweb who (I think) helped to develop Omeka. And I didn’t realise in my first year at DHSI that one of the people out the front of the class, Julia Flanders, was a world expert in TEI, because she was so approachable and no question was too basic for her to answer. And leading on from the two points above: an emphasis that we are all learning. Expertise in this field can only ever be in process, and those with that expertise are almost always more than happy to share it. Things you’ve been longing to learn which someone volunteers to teach during the lunchtime unconference. Regular expressions. QGIS. Python. While an hour or so isn’t enough to learn these in any systematic way, it is still amazing how much easier it is to figure something else out on your own once you’ve had a quick introduction and the chance to ask questions. The serendipitous possibilities that open up when you move outside the orderly conventions of regular academic conferences and ask people to organise themselves into sessions based on what interests them right at that moment, rather than nine months earlier when everyone wrote abstracts based on what they imagined their findings would be. There is a place for carefully written conference papers and formally structured sessions, of course. But when you take a group comprised of, say, librarians, publishing interns, university press employees, TEI devotees, TEI sceptics and academics, and give them a chance to debate the ideas raised in a colloquium session about academic publishing and shifts in the infrastructure of book production and distribution, you create the conditions for all sorts of intriguing insights to arise from the meeting of different disciplinary viewpoints and different forms of practical expertise. Twitter. This post is a testament to the many useful things I’ve discovered through Twitter, and indeed for many people it needs no introduction. If you are yet to use it for scholarly purposes, though, then there are two reasons to start. First, as one participant pointed out – on where else but Twitter – having conversations with other people on the #DHSI2012 backchannel makes it a fair bit easier to talk to them in person. (And also convenient: someone I was exchanging messages with turned out to be sitting behind me, and quickly walked me through the tool we’d been discussing when the colloquium session was over.) Second, for those who feel overwhelmed with the sheer number of projects, clever tools, programming languages etc that it feels like you have to keep a handle on, Twitter can function as a useful filter. Once you are following enough of the right people, you can more easily keep track of which resources are being used and are generating excitement, and you can prioritise those. Using your brain in a different way. Attending non-DH conferences now feels to me like a curiously one-dimensional affair. Following three threads of a lunchtime unconference on the backchannel while sitting in a fourth, with part of my head trying to figure out a problem that came up with my data that will need to be fixed that afternoon, I emerge feeling like I’ve been to not one but multiple DHSIs. It can be draining, and requires a different form of attention to the kind one gives to a task such as immersive reading, but given that travel and time are both expensive, I very much appreciate the way that DHSI packs a great deal into a short space of time. Excellent, inspiring presentations, many of them by talented graduate students. Digital humanists think hard about the way they present information, whether it is part of a Prezi slideshow or a digital edition. (And even when what is being presented is inspired silliness, the production values are still high). I learned much this week about how to engage an audience without compromising the substantive content of the message. Access to tools you might not have at home. ArcGIS is proprietary software, and expensive, but with a little bit of running between sessions on the final day, I got it to crunch through a massive dataset of Paris roads, polygons and points and extract the bits I needed. Seven minutes before my shuttle to the airport was due to leave on the other side of campus, it finished its export and now I have a set of shape files I can work with in the open-source program QGIS. Result. The joy of building. Lots has been written about the ethos of building in DH, and this is amply in evidence at DHSI. Of the apps that were showcased in the final session, my favourite came from @mchlstvns: in a few days he built an app for walking around Dublin in the footsteps of Leopold Bloom. And the #digiped folks didn’t just talk about digital pedagogy for a week, they built a resource for the rest of us. A chance to make your own work meaningful.I had fun building a SIMILE map as a sandbox for other lit folks to use if they wanted to explore the geographical dimension of a text without going to the bother of constructing a map interface themselves. After various conversations at Monday’s reception, it will now have a few more users, including some at Algoma who I may never meet, but I’m happy if they can make use of it. Connections. A grant call crossed my desk the other day for bringing people together for expert meetings, and I couldn’t quite see how to use it at the time. After the mapping and visualisation session, though, I now know exactly how it could be used not just to drive forward my own EMiC project, but also support the research agendas of several other people and projects. New friends as well as old. Hello, fellow Aussie Anya, fellow Londoner Bo, and fellow Canadianist-outside-Canada @readywriting. Hello, Georgia Tech librarians in my GIS class who were surprised to learn that their Vertically Integrated Projects had been exported to Strathclyde as one of the ways we teach DH. Hello, talented literary folks scattered across the US and the Pacific who are pursuing the same kinds of research questions I am with maps, networks, visualization and modernism. I am so happy to have made your acquaintance! And this is not even to begin on the breathtaking beauty of Victoria, tame deer grazing casually outside the student residences, local BC beers, and the impressive quality of EMiC’s collective karaoke chops. Thank you, Dean, and thank you, EMiC colleagues and friends. It’s been a fabulous, invigorating, beyond exhausting week. And now I’m going to crash. I’m at the Digital Humanities Summer Institute at the University of Victoria this week. I’m taking a course on the Pre-Digital Book, which is already generating lots of interesting ideas about how we think and work with material texts, and how that is changing as we move into screen-based lives. There are, of course, many implications for how these differing textual modes relate to how we study and teach proletarian material, and more importantly, how class bears on these relationships. I hope to share some of these ideas as they have developed for me over the week. The course has taken up these questions in relation to medieval manuscripts and early modern incunablua and print, but the issues at stake are relevant for modern material as well. The instructors and librarians were kind enough to bring in a 1929 “novel in woodcuts” by Lynd Ward for me to look at – more on that will follow. But, for fun, I also wanted to post about a little analysis experiment I did with some textual analysis tools. 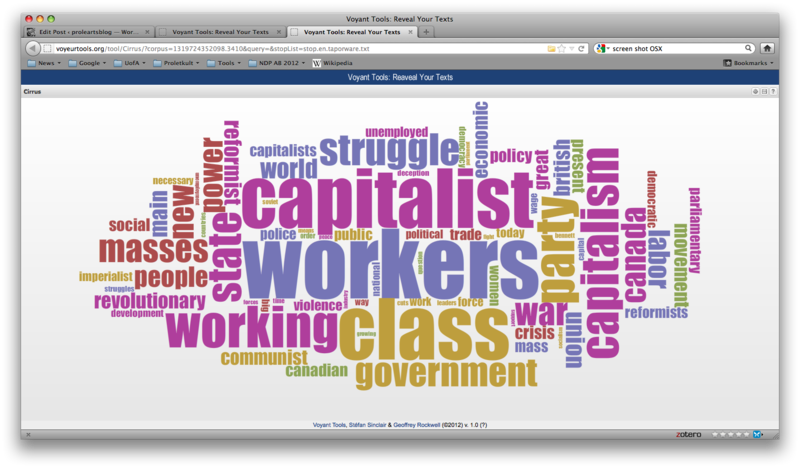 I used the Voyant analysis tool to examine a set of Canadian manifesto writing. I transcribed six texts either from previous print publications or from archival scans for use as the corpus. These included: (1) “Manifesto of the Communist Parties of the British Empire”; (2) Tim Buck, “Indictment of Capitalism”; (3) CCF, “Regina Manifesto”; (4) Florence Custance, “Women and the New Age”; (5) “Our Credentials” from the first issue of Masses; and (6) Relief Camp Workers Strike Committee, “Official Statement”. [The RCWSC document remains my favorite text of all time.] Once applied, the tools let me read the texts in new ways, pulling out information or confirming ideas that I had about them in meaningful ways. You can find the summary of my corpus here. The simplest visualization is the Cirrus word cloud, which at a glance shows that these texts are absolutely dominated by the language of class and politics (unsurprising, as they are aimed at remaking the existing class order). Michael Denning’s statement in The Cultural Front that the language of the 1930s became “labored” in both the public and metaphoric spheres is clearly reflected in this image. Looking at the differences among the materials, an analysis of distinctive words is a simple way to get at the position of a given text in relation to the others. We might think of these Canadian manifestos as occupying the same ground of debate (though they are not responding to one another directly), but not necessarily sharing the same tent. For example, the “Manifesto of the Communist Parties of the British Empire” shows a much higher concentration of the term “war”, which helps situate it to later in the 1930s. The “Regina Manifesto” is overwhelmingly concerned with the “public” as it plans for a collective society. Florence Custance’s feminist statement shows itself to be more unique in its own time, as it uses “women” and female pronouns far beyond the other texts. And the Masses text betrays its literary periodical background with its heavier use of “art”. The density of vocabulary in the texts can tell us something about intended readerships, and purpose of the text. Masses plays with the linguistic conventions of the manifesto to develop a text that is both assertive and creative; accordingly, it uses the largest variety of words to do so. However, the RCWSC is not far behind in its forthright call to action, which tells me something interesting about the role of the imaginative mode in connecting revolution with creative acts. Buck’s “Indictment” is the least dense text. It’s also the longest, which makes for a highly repetitive text. The “Indictment” has a strong oral quality to it, commenting on Buck’s trial and defense and with response and Marxist analysis. It is also highly indebted to that style, parsing its terms minutely and using them for step-by-step explanations. It is in many ways the most didactic of the texts, as the word density suggests, though such analysis misses the purposeful element of the limited word choices. I find Buck’s repetition to have an incantatory quality connecting it more closely to spoken debate than the other texts, an impression that comes out of working with the text closely, while typing and re-typing, and reading it aloud for myself. Word density is not for me an assignation of value; rather, it is one of many ways of framing some thoughts on how these texts – and manifestos more broadly – employ particular rhetorical modes and how we can follow them through. Here is the link to the Voyant analysis of my manifestos. I invite you to take a look, play around, and consider throwing up some text from other working-class and proletarian sources. It seems to me that a lot of textual analysis begins by reaching for “important” texts – those that are canonical, or historical. The tools make no distinction – I would like to see more examples of writing from below feeding into the ways we think about texts in the DH realm. Throughout this week (my first DHSI!) the lack of tenure-track positions for those currently graduating with doctoral degrees was a major topic of discussion. In personal conversation with wonderful EMiCers and non-EMiCers alike such as Kersta, Melissa, Emily Ballantyne and Emily Sharpe; Alyssa Arbuckle, Sandra Parmegiani, and Caley Ehnes; and Donna Bilak and other new acquaintances at the Institute, dissatisfaction with what Daniel Powell called “the straight and very narrow path” on which academics are set today was palpable. Wednesday’s unconference session on Alt-Ac, DH, and Graduate Training (organized by Powell, Alyssa Arbuckle, Alyssa McLeod, and Shaun MacPherson) provoked denigration of the narrow track from graduate programs geared too exclusively towards the acquisition of pedagogical, professional, and methodological practices necessary for that specific but oh-so-elusive tenure-track position. This particular session focused on restructuring graduate programs as a method of providing academics with more transferable hard skills and thus a wider individual arsenal with which to tackle job market, both Ac and Alt (as in Ryerson’s Literatures of Modernity program – http://www.ryerson.ca/graduate/literatures/. See full notes from the unconference session here: https://docs.google.com/document/d/1CKuRYHE7D157D6vHrLmySwCPX4ViHD_G6OaAvM1h86k/edit?pli=1). But for me the format of the session itself was the most effective answer to the problem at hand: the meeting provided a timely platform for the type of preliminary autogenic and collaborative work which is, in my view, the best response to a decaying hierarchical structure of academic competition and intellectual siloing. I thought the session, in which graduate students and recent graduates defined their own concerns, articulated their desires, and identified existing models on which to build, was a succinct example of how the soft skills of collaborative brainstorming, crowd-sourcing, large-scale trouble-shooting, and project planning learned in DH can be practically applied to change the largely unsatisfactory existing structures of graduate training and academic opportunity. With so few tenure-track positions currently available – especially teaching Canadian literature in Canada – it is clear that academics need to create their own opportunities outside the traditional walls of the academy. My experience and discussions this week have solidified my belief that not only is this creative self-sustenance a necessity, but, especially for those in the digital humanities who have been part of collaborative and innovative digital initiatives, it is a very realizable possibility. I think we should look at this dearth of access to traditional, well-defined professional “tracks” which may suit our skill sets but not necessarily our research interests, personalities, or lifestyles less as a major professional concern enhancing collegial competition, as this view leads to further entrenchment of departments in traditional disciplinary models as various fields attempt to protect their practices from interdisciplinary dilution. Rather, the inevitable breakage of this archaic system can be viewed more as an opportunity for junior academics to identify our own individual niches, point them out, and fill them. While this seems idealistic, such examples of collaborative initiatives for intellectuals outside or in partnership with the academy can be found close at hand in DH: the Modernist Commons in which the Digital Editions class has been working this week is one of many examples in DH of autogenic scholarly creation – born, of course, of the mother of necessity. Specifically literary endeavours for academics include Ooligan Press’s Graduate Program, which provides MA and MS degrees in book publishing in partnership with Portland State University, is a student-run press which publishes in both print and digital media (http://ooligan.pdx.edu/graduate-program/); while initiatives like the independent Netherlands-based think-tank Kennisland (http://www.kennisland.nl/en) provide a model for larger and more interdisciplinary (quasi)-Alt-Ac involvement. The more doctoral graduates with experience in DH use their experience in collaborative project planning to plan and build the career they want, the less legitimate the current “one-track-fits-all” mentality will become, and the pressure felt by those within graduate studies to compete with one another to support existing, unsatisfactory structures may be replaced by the impulse to collaborate and create new ones. Examples of successful Alt-Ac projects, suggestions for new ones, and ideas for funding are welcome! Undergraduate students at St Thomas University are in the process of creating the Atlantic Canadian Poets Archive “to answer a need for academic scholarship on writing of the Atlantic region.” They invite submissions to the archive from undergraduate students. The Atlantic Canadian Poets’ Archive started as an idea among a group of seminar students and their professor. Through the fall of 2010 and the winter of 2011, the students of Dr. Kathleen McConnell’s Contemporary Atlantic Canadian Women Poets’ seminar slogged through databases in search of scholarship. We found physics papers, geological studies, a handful of reviews, but no scholarship. So we wrote it ourselves. Though constrained by our undergraduate status (we take our editorial process seriously, but the Archive is not peer-reviewed), the contributions on the ACPA are the first of their kind: succinct critical analyses of poets from the Atlantic region, available to the public with a few keystrokes. Each poet featured on the ACPA has a short critical analysis, a biography, a comprehensive source list, and the text of the poem which is being analyzed. Among the challenges we faced as editors was obtaining contact information for some of the poets. In some instances, these poets had written the requested poems decades earlier, and then promptly disappeared from the public eye. Poetry from the Atlantic region is obscure already, so finding contact information for even less recognized poets proved challenging. Fortunately, the tight-knit, supportive atmosphere of Atlantic Canadian poetry has worked in our favour. To illustrate: we had been trying to get ahold of Newfoundland poet Carmelita McGrath. We explored the usual avenues: checked out organizations she had been involved in, scoured university faculty pages, but no one knew where to contact her. We became obsessed. In the middle of our hunt, two of the ACPA editors had gone to Great Village, Nova Scotia for the Elizabeth Bishop Centenary Festival. Among the poets reading at the festival was Michael Crummey, another Newfoundlander. When the editors met him, they described the McGrath Conundrum. After conceding that yes, of course, he’s an Atlantic Canadian poet too and we’d include him as soon as possible, he promised to put us in contact with Carmelita McGrath. The two, it turned out, were old friends. Because St. Thomas University (the birthplace of the Archive) is an undergraduate institution, the editorial staff for the Archive is impermanent. The founding editor graduates next spring, while our second editor, Allyson Groves, has already graduated. Maintaining the project has become a key concern for us, as we strive to maintain the editorial continuity we have established while also ensuring our own academic growth. It is this growth that we want to see in the Archive in the following years. It allows students to contextualize their analytic and editorial skills in a real-world situation, while also helping to fill a gap in academia. We welcome submissions from undergraduate students (though exceptions may be made on a case-by-case basis). Our complete Submission Guidelines, along with some great analyses, are available at stu.ca/acpa. It is with great pleasure that we announce the results of the 2012-14 Postdoctoral Fellowship and the 2012-13 MA and PhD stipend competitions. We received an impressive batch of outstanding applications at all levels. Many thanks to members of the postdoc and graduate awards committee (Paul Hjartarson [Chair], Neil Besner, and Alan Filewod) for their expert adjudication of these appplications. EMiC has awarded one new postdoc fellowship to Emily Robins Sharpe (University of Guelph) and five graduate stipends to candidates working on EMiC-affiliated editorial projects (Melissa Dalgleish [York University], Christopher Doody [Carleton University], Alana Fletcher [Queen’s University], Freeda Wilson [University of British Columbia (Okanagan)], and Katherine Wooler [Dalhousie University]). My postdoctoral work contributes to a collaborative project, “Canada and the Spanish Civil War: A Digital Research Environment,” which I am co-directing with Dr. Bart Vautour, an EMiC co-applicant. The Digital Research Environment (DRE) is a long-term, multi-phase project that will provide integrated public access to the large amount of diverse Canadian cultural materials concerning the Spanish Civil War (1936–1939). The conflict animated Canadian public discourse, and inspired nearly seventeen hundred Canadians to travel to Spain where many joined the International Brigades as armed volunteers in the anti-fascist cause. The artistic community in Canada also adopted Spain as one of the most rigorously represented subjects of the time. Yet, while American and British scholarship on the conflict has persisted, Canadian cultural texts remain dispersed, difficult to access, and in some case completely undocumented. Our project begins to remedy this unfortunate critical disparity by seeking to develop a long-term research agenda for the recovery and remediation of Canadian responses to the conflict. Dr. Vautour and I envision “Canada and the Spanish Civil War” as a three-phase project that aims to alleviate this critical gap, representing the first scholarly effort to collate this Canadian material for public consumption in a systematic way. The first phase requires conducting archival research and gaining digital skills, as well as scholarly consultation and project development. The second phase of the project builds upon the first to see the preparation and publication of a clean-text print anthology, Selected Canadian Writing on the Spanish Civil War, with a scholarly apparatus housed in the DRE. The third phase of the project—perhaps the most logistically challenging—will see a massive collation and digitization in order to create a digital collection within the DRE. I am excited to take up my postdoctoral fellowship at the University of Guelph, where I will work under the supervision of Dr. Susan Brown and Dr. Alan Filewod. I am currently at work on a digital social-text edition of Anne Wilkinson’s first collection, Counterpoint to Sleep (1951), which I’ve planned as the first of five modular editions that together will comprise the digital Collected Poems of Anne Wilkinson project. Rather than attempting to replace existing editions of Wilkinson’s work, my project seeks to reproduce them in digital form in order to illuminate the ever-evolving composition, transmission, and reception history of her poetry. The digital Counterpoint is image-based in order to foreground the reading experience in the edition as it was originally published and read; readers will also be able to view all of the variant versions of the poems in the collection, read embedded notes that highlight textual variance and provide bibliographic and explanatory information, and challenge or support my editorial decisions. My project is to start creating a digital edition of P.K. Page’s Brazilian Journal, as part of the larger Digital Page Project. It will be a database, containing a reading version of the text, alongside all its variant versions—there are nine manuscript versions, and three variant print versions of the text. For each variant version, the database will contain both a high-quality image and a transcription of each page. This will allow users to quickly compare changes between the different versions of the text. It will also allow users to follow Page’s creative process as the text was transformed from a personal written diary in Brazil in the late 1950s to a published public text in the late 1980s. The project I am currently undertaking with the assistance of an EMiC PhD stipend will produce an open-access, online database of the primary materials of George Whalley. One of the aims of this project is to make Whalley’s poetry manuscripts and typescripts and documents related to their production (such as related letters, personal papers, and photographs) available to a wider scholarly audience. The database is also foundational to subsequent digital and print editions of Whalley’s works Michael DiSanto (Algoma University) and I will produce, the first of which is a digital edition of selected materials that will provide rich insights into Whalley’s creative process as a poet. This digital collection will serve as the counterpart to a scholarly print edition of Whalley’s collected poems that Professor DiSanto is editing for McGill-Queen’s University Press, with an expected publication date of 2015. The focal point of this project will be to present a digital visualization of the evolution of a given chapter of Gabrielle Roy’s Bonheur d’occasion. Under the supervision of Dr. Karis Shearer, I will focus on the major editions between 1945 and 1977, as well as the two English translations (The Tin Flute), and identify the differences (additions, changes, omissions) which occur between each of the editions and the original, and then proceed to determine the source (author, editor, translator) and reason (language, text length, etc.) for each change. The resulting data will be organized and structured in a digitized, 3D format in which the data can be manipulated, allowing for further research. Other scholars will be able to build on this work, expanding the research to cover an entire text, to include several or all of Roy’s texts [or other authors’ works] and to incorporate this research in larger projects. I will be creating a digital critical edition of bpNichol’s works that highlights Dada aesthetics within his writing. Using genetic criticism to emphasize the evolutionary nature of his multi-versioned works, the edition will highlight Nichol’s use of intermedia, word processors, and unconventional forms. A digital medium will expand the functionality of genetic criticism to encompass Nichol’s attention to bibliographic codes. Nichol’s poetry, prose, and drawings deserve a non-traditional textual apparatus, a redefinition of the standard systems of criticism, and the adoption of new bibliographic codes to better reflect the text and the purposes of the paratext. By implementing these changes, my critical edition will become a direct extension of the creative work, as opposed to a format in which the text and the textual apparatus are completely different species.